'Onam', the biggest festival of the malayali community is being celebrated with much pomp and vigor. During the festive season, prominent malayalam channels provide the best viewing experience for with viewers with innovative and colourfull programmes. Like the previous years, in 2014 also all the prominent entertainment channels like Asianet, Mazhavil Manorama, Amrita TV, Kairali TV, Jeevan TV and Surya TV would deliver hours of nonstop entertaining activities including movies, chat shows and humour skits for the spectators. Along with the popular channels, Kiran TV will also air the best movies from their library. The channel being a subsidiary of Sun Network has few interesting films to thrill the moviegoers. Along with malayalam movies, the channel is all set to deliver super hit tamil flicks for the fun loving viewers. 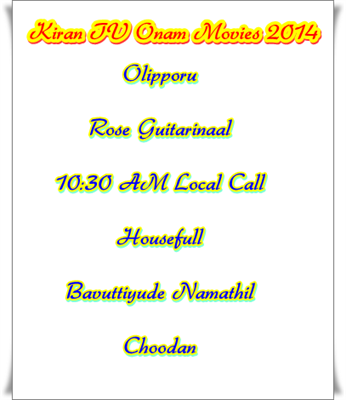 Kiran TV would unveil 5 malayalam movies during 5th – 9th September 2014. Olipporu, Rose Guitarinaal, 10:30 AM Local Call, Housefull and Bavuttiyude Namathil are the 5 malayalam movies, while dubbed versions of Telugu hits Gajapokkiri and Choodan will deliver maximum thrilling moments. Super hit tamil movies Biriyani, Enthiran, Thalaivaa and Singham would make this Onam much delightful. 'Olipporu' directed by A V Sasidharan starring Fahadh Faasil and Subhiksha in lead roles revolved around the life of a blogger. 'Rose Guitarinaal' written and directed by Ranjan Pramod featuring Richard Joy Thomas, Manu and Athmeeya Rajan was a romantic entertainer. Meanwhile Manu Sudhakaran's '10:30 am Local Call' was a thriller for the young audience. The movie which had Nishan K. P. Nanaiah, Shritha Sivadas, Kailash, Lal, Mrudula Murali and Jennifer Antony in prominent roles couldn't win the hearts of the spectators. Filmmaker Linson Antony's 'Houseful' creamed with humour starring Tini Tom, Jyothirmayi and Shammi Thilakan in prominent roles. The movie which tells the tale of a police constable named Ananthan received balanced review from the theatres. Mammootty's 'Bavuttiyude Namathil' written by Ranjith, and directed by G. S. Vijayan gained well reception in the box office. Kiran TV would also deliver good time for the movie enthusiasts with Telugu and Tamil hits. So, enjoy this Onam festive season watching the delicious movies offered by Kiran TV.